Nana's Recipes was born during a visit with Nana and Papa Welton in May of 1998. (I actually call them Mom and Dad, it's the grandchildren that call them Nana and Papa!) During my visit I watched my Mom tediously copy recipes by hand to send to relatives. 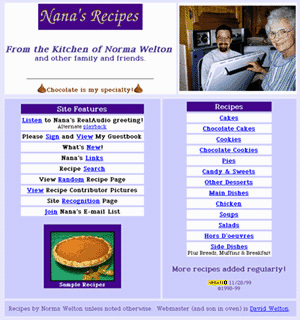 At that moment Nana's Recipes was born — I knew of a better way to pass on my Mom's recipes to interested people: the Web! At the time we were doing family genealogy research, so my mind set was already one of preserving cherished pieces of our family history — and food is a huge part of any family's history. The site was first on the Web in early June 1998. Many years later the site has grown to about 300 recipes and received recognition from many sources. The picture at the right shows the home page from November 1999. The site has evolved over the years, but I've tried to keep it simple and homey — just like the recipes we feature. How does Nana get her recipes? The majority of the recipes are Nana's. But she is blessed with many family and friends who also enjoy the same kind of home cooking she does. Some of the recipes are from these family members and friends. Nana writes her own recipes and sometimes edits contributed recipes for clarity. Nana and Papa send the recipes to me via e-mail (we live about 150 miles apart in Northern California). I know precious little about cooking, but I have many years of experience as a college instructor, instructional designer and media producer. So, I know how to write and deliver instruction with media. At its core, a recipe is simply instructions — so the blending of Nana's skills and mine were a perfect match! I do all of the Web site design and write all the text, except for the recipes. In other words, the "voice" of Nana's Recipes is Nana's son, David Welton...me! Of course, Nana reviews all material before it appears on the site. We add new recipes regularly and publish a quarterly "What's New" page that describes new recipes and other happenings on the site. Maintaining the site is a lot of work, but it's a labor of love. How do you get the food images? One thing that sets Nana's Recipes apart from other recipe sites are the images we include. We know that a picture is worth a thousand words — especially when it comes to recipes. Over the years Nana, Papa and I have honed our skills in the art of photographing food...no easy task. The professionals rarely use actual edible food in their shots, not us. All the completed recipes you see on our site are real, and have been eaten by Nana, Papa, family or friends! Many of the photographs were taken in Nana's home. In the early days of this website, my late dad, Papa Welton, used his video camera to capture recipe images. At the time Nana and Papa used a web browsing device called WebTV — a box that connected to a regular TV and allowed for basic web browsing and email. The WebTV device allowed the connection of a standard video camera. It also had the ability to grab one frame of video and turn it into a still image (composite video at 640 x 480). Papa created this image and emailed it to me. In 1999 this was cutting edge stuff. But compared to the digital cameras we have today, it was very crude. Our long-term project is to replace the poor quality old photos with new ones. How did you make the oven animation on the Front Page? The trademark image of the site has become the animated image on the front page — the one that shows Nana in her kitchen with me jumping out of the oven. I wish I could take credit for creating this animation, but I can't. It was created by Sean Kane in the Summer of 1998. I worked with Sean at the time, and he offered to scan some images for me. He saw an opportunity to take two of the images and make an animation. A few minutes later (he is very fast!) the creation was done. Initially I showed the animation to Nana and described it as a joke...I didn't think she'd want it on the site. I was wrong! Nana loved it and the image has been our trademark ever since. Play Nana's Scavenger Hunt Game!